Jimmy Carter has 5 media appearances. Jimmy Carter discusses Always a Reckoning and Other Poems. 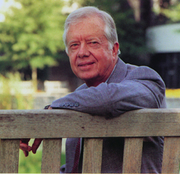 James Earl "Jimmy" Carter, Jr. (born October 1, 1924) was the 39th President of the United States from 1977 - 1981, and recipient of the Nobel Peace Prize in 2002. Prior to becoming president, Carter served two terms in the Georgia Senate, and was the 76th Governor of Georgia from 1971 - 1975. Jimmy Carter is currently considered a "single author." If one or more works are by a distinct, homonymous authors, go ahead and split the author. Jimmy Carter is composed of 6 names. You can examine and separate out names.